A new marvel is sweeping across organizations, promising to positively transform work. It’s called the employee experience and its one of the most talked about developments in human capital management circles today. But, behind this talk, lies a lot of confusion. What exactly is the employee experience and how can organizations get in on the benefits it promises? To find out, I sent some questions to Benoit Hardy-Vallée, Associate Partner and IBM Canada’s Lead—HR Reinvention, Talent and Transformation. Check out what he has to say in this blog post. Then watch his presentation on APQC’s April 2019 HCM webinar: Transforming the Employee Experience at IBM: Personalization, Access, Convenience. Employee experience is a holistic understanding of what employees do—the physical environment, the culture in which they evolve and the work and activities (increasingly through digital means) that they perform. These three dimensions come together throughout the employee lifecycle—there is a candidate experience, onboarding, learning, working experience, etc. Each moment that matters in a day or in a career can be understood with the experience lenses, i.e., what does it look like from the perspective of the employee? Is there a sense of personalization, access, convenience and authenticity? A lot of that approach is inspired by previous work in customer experience—HR is just applying it to employees. How does the employee experience differ from employee engagement? Experience is what it feels like to be an employee. Over time, if you have many positive, constructive, meaningful experiences, you will be more engaged. Engaged employees have higher retention and productivity because they care about the work, the workplace and their organization. Engagement looks at the relationship between the employee and the organization, with drivers such as trust in leadership, communication, recognition, career development, and future vision. In short, it’s about good management and good leadership. We engage employees by appealing to their aspirations and rewarding them, it has a fundamentally human dimension. Experience, being a broader concept, encompasses also the physical layout of your workspace, the flexibility of your work hours and location, the quality of the digital systems that you use, etc. How are employee experiences and HR processes different? It’s really about the perspective. Employee experience is subjective, first person—your onboarding experience (for instance) is the “what it feels like” to start working for your organization. Is it easy, engaging, seamless? Did I feel welcome, included, enabled, oriented, equipped? HR processes on the other hand look at onboarding as a set of processes—finance, IT, HR, facilities, etc. Together these processes can be orchestrated to create a positive experience—or not. The experience is the outcome. Good HR processes are designed for efficiency and experience. Why is there so much interest in the employee experience today? There is no doubt that top talent looks for the best experience. Consumer technology (the Amazon, Apple, Uber, Netflix, etc.) is now increasingly easy to use and user-friendly, and employees are expecting the same experience. There is still a war for top talent—and the employee experience provides another differentiation factor to attract and retain—and ultimately to increase the customer experience. There is also a new implicit social contract between employers and employees—a job and a salary is not enough, employees want to feel good at work rather than compromising their well-being for the 40 hours (or more) they spend at work. 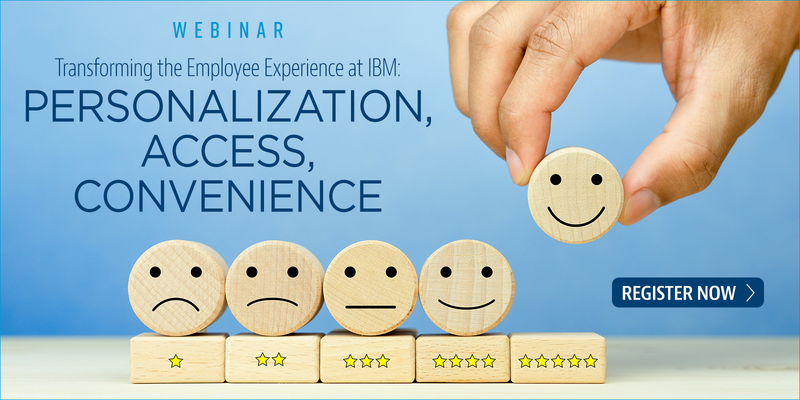 You spoke on an APQC webinar about how IBM has transformed its employee experience. Can you provide an overview of what you shared? Certainly! I shared a few principles that guided IBM’s own HR transformation, how we use a modern approach to change management and how we reengineered a few key HR processes with the employee experience in mind.